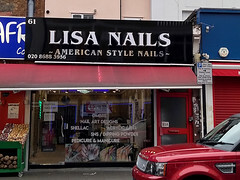 Manicurists on London Road. It opened in October 2018. See the Past and Present of Croydon's London Road for history up to late 2014, at which point the premises were in the process of becoming Kaakyire African Market photo. Kaakyire opened in December 2014 but closed down again some time between March and October 2017. It sold fresh vegetables such as red onions, yams, pea aubergines, and various African greens; groceries such as palm oil and garri; and ready-cooked meats such as suya (spiced grilled meat on skewers) and turkey tails. By October 2017 number 61 was vacant and stripped out photo. Some time between March 2017 and June 2018 the premises were amalgamated with the next-door number 59 into Fresh Africa, stocking groceries in number 59 and fresh fish in number 61 photo. However, by August 2018 the fish had gone and number 61 was advertised to let photo. Last edited 2019-01-17 14:27:07 (version 37; diff). List all versions. Page last edited 2019-01-17 14:27:07 (version 37).